NOTE: Like the Mountain State's roads, this site is undergoing construction. An extensive overhaul is underway, with a new format being implemented. This new format can be seen on the Interstates and US Routes pages. Please be patient as we improve this site for your convenience. Why did I, a Kentucky resident, create a West Virginia Highways Page? Well, there are several reasons. First, there was no West Virginia Highways Page yet on the Internet. Second, I didn't do Kentucky because my home state has too many unmarked routes, many of which don't even show up on the county maps because they are city streets, and I wanted to make my contribution to the growing amount of road-geek information available on the Internet. Third, I have a working familiarity with West Virginia highways. Fourth, my grandfather Elkins was from that state (Lincoln County, to be precise). And finally, it was pretty easy. There aren't that many numbered state highways in West Virginia. There are five separate pages cataloging West Virginia state-maintained highways, for Interstate highways, U.S. highways, and state highways 1-49, 51-99, and three-digit routes. The route number is in the left column, followed by starting point and ending point, based on the intersecting route number or where it enters West Virginia, and the county where the route begins or ends, or enters or leaves the state. This site presumes use of the standard milepoint numbering system in that roads "begin" at their south or west terminus, and "end" at their north or east terminus. 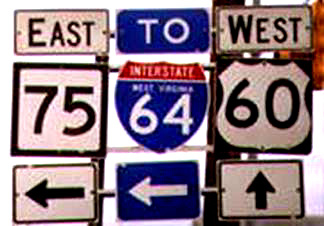 A few West Virginia U.S. highways are signed in violation of the numbering convention (even numbered routes are supposed to be east-west; odd numbered routes are supposed to be north-south). These circumstances are noted in the "Notes" column at the right. A listing of all counties the highway passes through follows the ending point, followed by the "Notes" column, where various comments about selected roads can be found. Not all highways have comments. There appears to be no set pattern to numbering West Virginia state highways, especially the three-digit routes, such as may be found with interstate or US routes. They seem to have been scattered across the state. Reviews of old maps, when some numbers were different from what they are today, show that apparently no pattern was ever used. There have been several renumberings of West Virginia highways, but I don't have the historical information to post on this page. For the most part, West Virginia routes are directionally signed the opposite of Interstate and U.S. routes. Odd state route numbers are generally east-west routes, and even numbers are generally north-south routes. There are exceptions. DISCLAIMER: This site is not affiliated with the West Virginia Department of Transportation or the West Virginia Division of Highways. This site is a personal project of mine and the information is compiled from first-hand knowledge, maps, and information provided by the WVDOH. If you have comments, suggestions, corrections, or questions, please feel free to E-mail me. Dave Cramer, an employee of the West Virginia Department of Highways, graciously provided lots of good information on West Virginia's highways. These documents are currently available in RTF format, which can be downloaded and read with practically any word processor in any format. PDF versions of these documents are now available. "A Brief History of West Virginia's State Route System"
This document provides a history of West Virginia's state highway sytem. "West Virginia State and National Highways -- Related Milestones"
This document lists milestones of highway development in West Virginia and the United States. "West Virginia Highways Classification Systems, Characteristics and Usage"
This document contains facts on jurisdictions, classifications, federal aid highways, signage (including county and delta routes), ARC corridors, road surfaces, and other information. "West Virginia Highways Revenues and Expenditures"
This document contains information on expenditures and revenues. Source of information: West Virginia Official Highway Maps 1994-96, and 1998-99, West Virginia DOT individual county maps compiled in a book published by C.J. Puetz, Thomas Publications, Ltd., Lyndon Station, Wisc., and personal first-hand knowledge. Many thanks to Michael Miller of Charleston, W. Va., for his extensive notes which have been incorporated into this page. Thanks also to David Cramer, an employee of the West Virginia DOH, for his helpful information. Comments, corrections, suggestions? E-mail me, please! This page created Nov. 15, 1997. This page last modified June 4, 2003.